Our clinic is modern with a comfortable well equipped hygienic environment for dealing with all kinds of foot problems. We can help you if you if your have Athletes Foot, Painful Corns, Calluses, Cracked Heels and much more. A callus or corn is a build up of skin that forms at points of pressure or over bony prominences. Generally, calluses form on the bottom of the foot, whereas corns form on the toes. Some nail problems can be conservatively treated with topical or oral medications while others require partial or total removal of the nail. 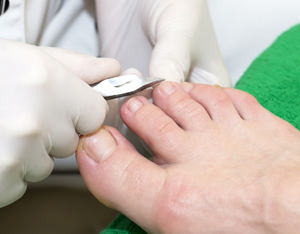 Any discoloration or infection on or about the nail should be evaluated by a podiatrist. We can help you if you if your have: Athletes Foot, Painful Corns, Calluses (Hard Skin), Cracked Heels, Diabetic Feet, Fungal Nail Infections, Ingrowing Toenails, Nail Trimming Problems, Thickened Toe Nails and more. We are located in peaceful surroundings 2 miles inland from the north Cornish coast near Boscastle. We easy to find with plenty of parking. Our clinic is modern with a comfortable well equipped hygienic environment for dealing with all kinds of foot problems. Our Practitioners are committed to making your feet feel as comfortable as possible. Don’t put up with foot pain & discomfort! Call now for an Appointment or complete the form.